1984 - Pascal Roche and Jean Henry Caul Futy. Gymnase Pierre Graff de Courtry. Pascal Roche and Jean Henry Caul Futy ( champion of France "Espoir" ) - 1983. Gymnase Pierre Graff de Courtry. 1990 - Luc Giraud called " Lucos"
USA Taekwondo has announced a new program to help aspiring Olympians fulfill their potential and reach their dreams. Athletes and clubs can solicit donations that will be tax deductible to the donor as long as the program guidelines are followed. Here is how the program will work. Athletes and USAT member clubs can solicit donations from individuals and or corporations. Funds to be donated are made payable to USA Taekwondo. The donating entity completes a grant application and submits with said funds to USAT. USA Taekwondo segregates the money and pays 86% of the money back to the member club for the approved deductible program. 7% of the money will go into a general fund for grants to any approved high performance program grant requests. 7% of the money will go toward offsetting administrative costs. Examples of approved activities include the purchase of LaJust EBP equipment for a club that can be utilized for all members of the club, coaches' travel to events where they are coaching all high-level athletes at the club and other examples as set forth in the program guidelines below. One of the important prohibitions in the program is that grants cannot be awarded to pay for the training of a few specific athletes. The grants must be for the benefit of the entire club. "USAT wanted to find a way to leverage its 501C3 tax exempt status for the benefit of its member clubs," said David Askinas, USAT CEO. "Recognizing that most dojangs in this country are for-profit entities we knew there was a need to establish a vehicle for individuals and clubs to solicit tax deductible donations to aid our high performance goals. After careful research into the applicable IRS laws we are confident that we have created a program that can legally benefit potential donors and clubs alike." 1. USAT shall set high performance goals that it will support with the donation program and will keep a public written statement of said goals. 2. The grants will generally be made to cover the cost of training equipment, travel expenses and other expenses that benefit every high level athlete at a private club. 3. Some of the funds may go back to high performance teams/ clubs to cover rental costs at their facilities. 4. Some of the funds may go to offset a coach's fees and travel costs for attending an event with his high performance team. 5. No funds will be sent to the taekwondo club owner for reimbursement of an individual athlete's training fees. 6. USAT will set up a grant application process and have an internal committee set up to approve grants from the program. 7. USAT will retain a reasonable portion of the donated funds for administrative purposes. 8. USAT will not grant dollar-for-dollar grants back to any donor's designated club. It will use a portion of the donated funds to make grants to other applicants. 9. Any donations made under this program should be classified as restricted donations for accounting purposes. The grant recipients shall prepare a yearly final spending report and submit to USAT for review and record keeping. Eric Quequet - savate defense, 14th of November 2009,Limoges, France. I have come to know that GM Tran Trieu Quan is trapped in his hotel in Haiti from since the recent earthquake that struck that country. I and all my students would like to say to GM Tran's family and members of his organisation how sorry we are to this tragedy. We pray from the bottom of our hearts for the safety of GM Tran. I hereby call upon all our ITF members under the Presidency of Prof. Dr. Chang Ung to, for once, forget the differences between our ITF and GM Tran's Taekwon-do organisation, and sincerely pray for GM Tran's safety. Sports politics and organisational politics are only games to be played by both sides. We should recognise that we are, whether we like it or not, all Taekwon-do brothers, and GM Tran is a 2nd or 3rd generation senior since General Choi founded Taekwon-do in 1955. I especially call upon Prof. Michel Jacques Laroche,President of ITF Haiti and his ITF members to do their best in assistance of searching and saving GM Tran Quan. Under such difficult circumstance, we simple must put down our differences, recognise the good works that GM Tran has contributed even though he is now a member of another group of Taekwon-do. He is still our brother, and a very senior one, and for that reason he deserves our prayers and concern. All Taekwon-do practitioners, irrespective of their ranks and organisations, are important to our ITF under our President Prof. Ph.D Chang Ung, IOC Member, who was personally chosen by our Taekwon-do Founder to succeed him to lead the ITF. Therefore the protective wings, and the loving care and concern, of our ITF President Prof. Dr. Chang Ung are over practitioners of all Taekwon-do styles or organisations, and that includes GM Tran Trieu Quan. At this stage, we must be engaged in prayers and concern for GM Tran's well being as top priority. Sports politics between our two organisations should take a back sit. "We pray to Heaven to take good care of the safety of our Taekwon-do brother GM Tran Trieu Quan. Lord, we place the entire situation in Your hands. Lord, Your will be done." Grand Master Trân was in Port-au-Prince on business when the earthquake struck Haiti last Tuesday. He was staying at the Montana Hotel (room 306). Grand Master Trân was seen going to his room 10 minutes before the earthquake. “My husband is trapped in the rubbles of the Montana Hotel and our family is still awaiting news from the rescue teams", Mrs My Nguyen Tran, his wife, said this morning. Dr. Janel Gauthier, former Chair of the ITF Ethics and Discipline Committee and close friend of the Tran family, stated: "Taekwon-do practitioners all over the world are hoping that Grand Master Tran will be found alive and well very soon. Their thoughts and their hearts go to his family. Many Taekwon-do Masters, Instructors and practitioners from the Americas are deploying tremendous energy and using all possible channels and tools of communication to get vital information to the multi-national professional rescue teams to locate Grand Master Tran in the rubble of the Montana Hotel. Others are rounding health and sanitation stations in Haiti and neighbouring countries in case Grand Master Tran has been evacuated without identification". "I thank all of those who are working the medias and the web, searching for information or spreading information on my father and his possible location", said Grand Master Tran's daughter Joliette. Grand Master Tran is the father of Joliette (6th degree black belt), Cécilia and Nicolas (4th degree black belt). Nature has shown us once again the strength of its capability by the recent earthquake in Haiti. Following this earthquake the suffering of so many people is almost beyond imagination. At these times we question our beliefs as to why any thing or one would want to cause so much despair and pain to so many. In the community of Taekwon-do within Haiti we have received reports of close and lost ones to our organisation, and we have heard of heroic activities by our members in their desperate attempts to save and comfort others. The ITF are aware the organisation led by Grand Master Tran Trie Quan are experiencing concern at this disturbing time with reports that Grand Master Tran Trie Quan is amongst the missing in Haiti. The ITF call upon all members to join together in their hopes and prayers for the safe return and wellbeing of all those missing in Haiti, and ask that all our active members around the world contribute whatever they can, no matter how small, to aid the earthquake disaster victims. 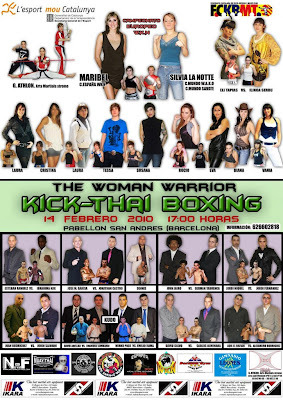 The woman warrior - kick/thaiboxing in Barcelona 14th of February, Barcelonia, Spain. 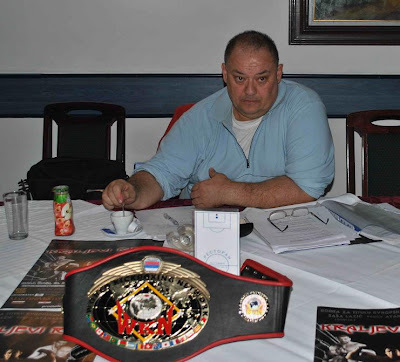 WKN WORLD PRESIDENT Mr. Stephane CABRERA. Savate fighter from Croatia - Ivica Cukusic against kickboxer with a nice haircut. Leader of "village" people party in Croatia. He is baking bread and is against genetics used in production of food. Did anybody talk about pharmaceutical industry and a powder food behind it? To move FIKB (Italian kickboxing federation) in CONI from a level 2 - associate disciplines (AD) to a level 1 - national sport federations (NSF). On a level 1 CONI - there is more money more support for sport and this is good for kickboxing and also savate. and with new forces from savate and muay thai pushed his newly named federation from level 2 CONI to level 1. After the Ennio Falsoni visit to Korea, WAKO KOREA supported by Dr Un-Yong Kim (former Vice President of IOC), has a new President whose name is Mr Mah Eyu-Woong (in the picture). He was officially elected during their General Assembly (see photos in the gallery). WAKO KOREA will also be officially recognized by their National Olympic Commettee in next February. WTF President Chungwon Choue poses with Miss Pongchanok Kanklab, the Miss Thailand World 2009, after giving her a plaque of appointment as the WTF Goodwill Ambassador in a ceremony at InterContinental Hotel in Bangkok, Thailand on Jan. 23, 2010. The World Taekwondo Federation appointed Miss Pongchanok Kanklab, the Miss Thailand World 2009, as a “Goodwill Ambassador” of the WTF in a ceremony in Bangkok, Thailand on Jan. 23, 2010. For the WTF, it marked the second of its kind after the WTF’s appointment of Mr. Dave Mustaine, the leader of the U.S. legendary thrash metal bank Megadeth, as the WTF Goodwill Ambassador in Seoul, Korea on Oct. 27, 2007. Miss Pongchanok, 19, was crowned the Miss Thailand World in 2009. She is a 2nd Kukkiwon Dan black-belt holder and served as a national taekwondo team member. In the ceremony, WTF President Chungwon Choue delivered Miss Pongchanok a plaque of appointment and an honorary 3rd WTF Dan certificate. The ceremony drew such dignitaries as Mr. Coleman C. Y. Lee, a WTF Council member from Chinese Taipei; Asst. Prof. Pimol Srivikorn, president of the Taekwondo Association of Thailand; Mr. Milan Kwee, president of the Singapore Taekwondo Federation; Mr. Chung Hae-Moon, Korean ambassador to Thailand. For the participants in the ceremony, Miss Pongchanok performed a taekwondo demonstration, followed by a demonstration by members of the Thail taekwondo demonstration team. “Thailand shows a very exemplary model among WTF member national associations in promoting taekwondo around the world and Thailand has produced good results at major international taekwondo competitons,” said WTF President Choue during the ceremony. On Jan. 24, the Taekwondo Association of Thailand organized the 2010 Invitational Taekwondo Demonstration Competition at a large shopping center in downtown Bangkok, drawing a total of 11 demonstration teams from all over Thailand. 12th of February - effective savate fighter will come to Croatia. 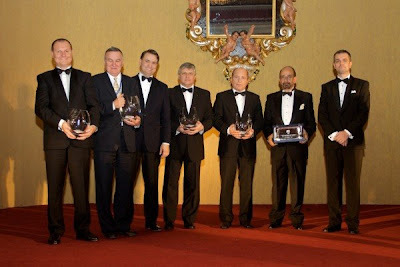 On Thursday, January 21, 2010, Bosnia and Herzegovina awarded their best sportsmen. The Sports Award Ceremony was held in the National Theatre in Sarajevo and was officially opened by the President of the Republic Mr. Zeljko Komsic. The President of the Republic welcomed all the invited guests, naming especially Mr. Alberto Gualtieri, EUSA President and Mr. Matjaz Pecovnik, EUSA Secretary General and thanked them for all the support during the process of incorporation of BiH in the membership of EUSA and FISU. The Ceremony was attended by 500 guests, among them also the President of National Sports Federation, Mayor of the City of Sarajevo, President of NUSA, President of the National Olympic Committee, Members of the Government, Best Sportsmen and Sportswomen, Trainers, Sport Journalists and Sponsors. During the event, the awards in 18 categories were presented. A significant place among them was given for the presentation of the Award for the Best Student Athletes. The Awards were presented by Mr. Gualtieri and Mr. Pecovnik and were received by Amel Mekic and Emma Skaljo for their achievements in Judo and Shooting. In his address to the audience the EUSA President thanked the National Sports Federation and its President, Mr. Omer Stambolic, for splendid organisation. He also thanked also the National University Sports Federation, that recently became a member of EUSA and FISU, and invited its President Mr. Branislav Crnogorac to receive the EUSA Award as a recognition for their efforts to promote sport among students and to support EUSA to build a stronger European unity also through the values of sport. The Ceremony, which was broadcast live by Hayat TV, closed with a rich cultural program. Club ABC BOXING - La Rochelle, France. One point system - like karate. Sad. otherwise I will make you coup de pied bas. Savate - french boxing - excellent training and competition ground for school children. Good attitude. Nice club. Congratulations. And the winner is University of Ljubljana. And look their calendar and history. If your stomach survived this attack of typical Slovenian humor than you should read something about this 2 million people country in the middle of nowhere Europe - EU. And I swear that I didn not pick this data on a Monty Python's website. Why Silvia doesn't want to talk about her boxing activities? FPI - Italian boxing federation produced FIKB - Italian kickboxing federation in Italian Olympic Committee called CONI. Italian University sport federation DON'T KNOW FOR SAVATE??? primo campionato Italiano Universitario di assalto presso il palazzetto CUS Pavia valevole per le selezioni ai Mondiali di Nantes. Will U.S.I.S.F. university sporsts FISU responsible help savate for FISU 2010 in Nantes? Web-site of this organisation is not very serious. We sized them up. We measured them, top to bottom. We've done our own Tale of the Tape, and we've come to a surprising conclusion. Pound for pound, the toughest sport in the world is . . .
That's the sport that demands the most from the athletes who compete in it. It's harder than football, harder than baseball, harder than basketball, harder than hockey or soccer or cycling or skiing or fishing or billiards or any other of the 60 sports we rated. In Page 2's Ultimate Degree of Difficulty Grid, boxing scores higher than them all.